Introducing the newly redesigned NM Engineering Control Arm kit. 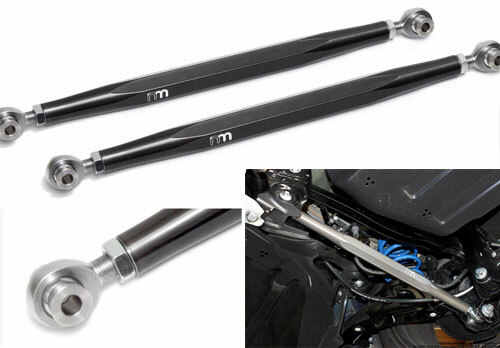 While others use 1" diameter 6061 aluminum material, NM machines our control arms utilizing aerospace grade 7075-T6 1 1/4" hex aluminum bars, finished with titanium tint Type III / Mil-Spec Anodize. The use of larger material provides rigidity and strength of steel bar but without the weight. NM Control Arm Kit also features precision heavy duty rod ends made from heat treated hardened steel with self lubricating nylon race. The threaded rod ends allow user to dial the suspension camber to desired specs, crucial for the weekend track enthusiasts and professional racers. T-303 stainless steel is used for the spacers to avoid any flexing and crushing caused by suspension load. Kit comes with two (a pair) complete bars with hardware, set at factory arm length. Vehicles with HID headlights can only install/replace lower control arms.